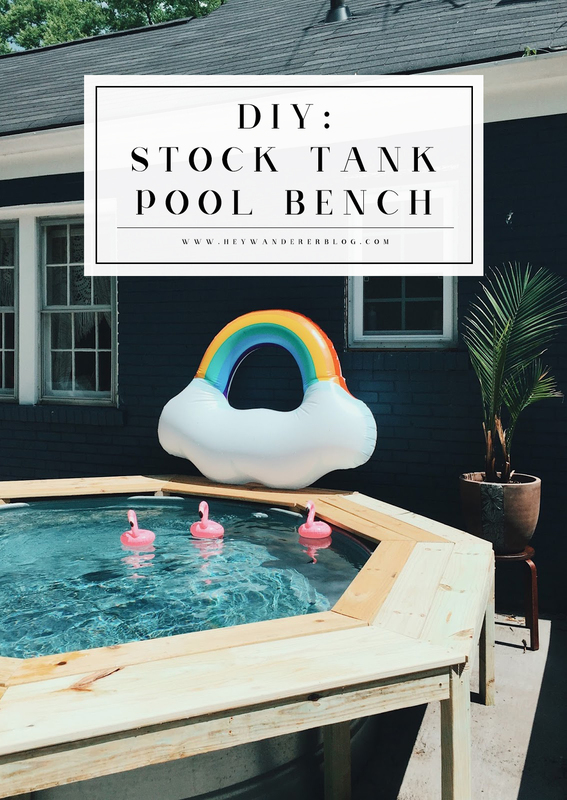 Guys, this stock tank pool bench is a game changer. Last year we just had the pool without any seating around it and our friends were left to either get all the way in the water or sit on the very uncomfortable edge. Can't blame a stock tank- it's not really what it was made for! Anyway, we decided to build a bench this year. It has been FANTASTIC. Being able to sit on the edge with your feet in the water means you'll be using the heck out of your pool. I'm going to be telling you the steps of what I did, but you will have to tailor it to your needs/pool size. There won't be amounts for the wood you will need because yours may be different. Anyway, let's get to it. This is the design I started with. The idea was to have 8 stands to hold the bench up, each of which bumped right up the the pool's side. These stands are just tall enough to allow for the bench top to sit over the top edge of the pool. 1. The first thing I did was take some string, and mark out 8 even sections. Now to be honest, my sections weren't really all that even. 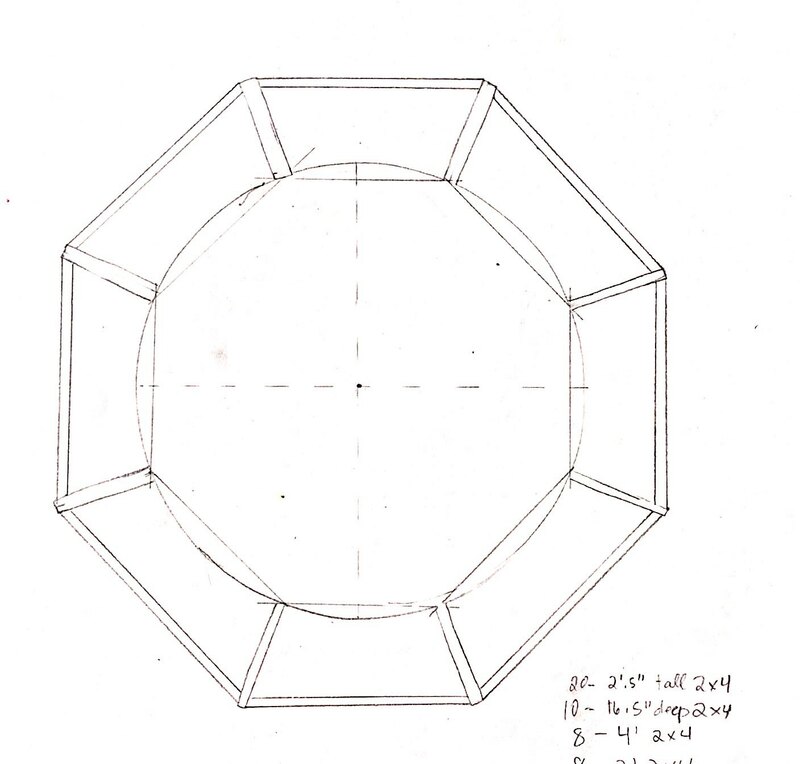 When I measured across our pool, I got a couple different measurements, meaning our stock tank isn't a perfect circle. So definitely keep that in mind. I started this project with a perfect sketch and strategy and soon realized I was going to have to sort of play it by hear. Anyway I just taped the two ends of a piece of string right in the middle of the pool and repeated that four times until it seemed like the sections where all even. This is where the stands for the benches will go. 2. The next thing I did was measure a piece of wood for each section. I took a 1x6 piece of wood and laid it on the edge of the pool where the bench would start closest to the pool. I measured the length between the two strings and then took a ruler to trace the angle where the string met the wood. Then I repeated that on each side and ended up with 8 pieces- one for each section. Then I cut each angle with a miter saw. When laid out, these pieces all create an octagon. 3. Next I laid three pieces of wood side by side and spaced them out about 1/4 inch. I made a spacer by taping together a bunch of business cards. I used a ruler to trace the same angle on each piece of wood. Make sure you are tracing where the angles both go outward and not inward. Each piece should be bigger than the next. Then I cut where I had traced. I ended up only doing a couple sections and then cut the rest of them as I was assembling the bench. This seemed to work best for me so I could be more exact. It's also a good idea to mark the tops of these pieces as you want the angles to match up correctly. I labeled all three pieces with the section where they belong. I assigned each section a number (1-8), and labeled the bench seat/top pieces according to where they were supposed to go. So I had 3 pieces labeled '1' and 3 labeled '2' and so on. 4. Next I assembled the stands. You'll have to decide how tall you want your bench to be. Ours it 26" tall and that seems to be the perfect height for sitting and dipping your legs in the pool. So you'll need to cut two pieces of 2x4 to the length of your bench height -2.5, so our pieces were 23.5". Then I cut a piece of 2x4 to 16.5" because that is the width we wanted. That was the easiest because 16.5" is 3 1x6 pieces laid side by side. Then I also cut a piece of 2x4 to be 13.5". This will make more sense when you watch the video, but the 16.5" piece goes on top. I screwed in 2 screws half way on each end of that piece and then put the edge of the 23.5" pieces up against the 16.5" piece and finished screwing the screws in. Then I placed the 13.5" piece in between the 23.5" pieces, right up against the 16.5" piece and screwed them together. Just watch the video, because this is starting to sound crazy. But once you've assembled these four pieces, you'll need to do it 7 more times. 5. Next I attached the bench seat/top to the stands. I took the three pieces of one section and placed the edges along the center of the top of a stand. Then I screwed the pieces down and turned the bench over. 6. Then I added the brace pieces. I cut three pieces for the bracing. One for the larger outside section between the two stands, one for the smaller inside section between the two stands, and then one between those two pieces. Again, refer to the video to see this is action. The ends of these have to be measured to the angle of the stands to fit in perfectly. I just laid a 2x4 on top parallel to the bench top pieces and then traced the angle underneath. I know it may be more time efficient to cut all of the wood at the same time, but this is just what worked for me. Like I said, I just kind of had to go with the flow on this project. Also, make sure that your smaller brace piece that will be nearest the pool isn't right on the edge. If it is, it will bump against the pool and won't allow for the stands to go right up to the pool. 7. Once I screwed the braces in, this section was complete and ready to be put in place. Our pump outlet is pretty high and came into contact with one of the braces, so I had to cut out the wood where the pump was. You definitely don't want a bench putting pressure on your pump connections. You'll want to line up the center of the stands with the string you placed on the pool earlier. If you measurements are correct, the bench section should reach from string to string. But if it doesn't, don't get too worried about it. You can adjust the next section you work on to be a little longer or shorter, depending on what you need. 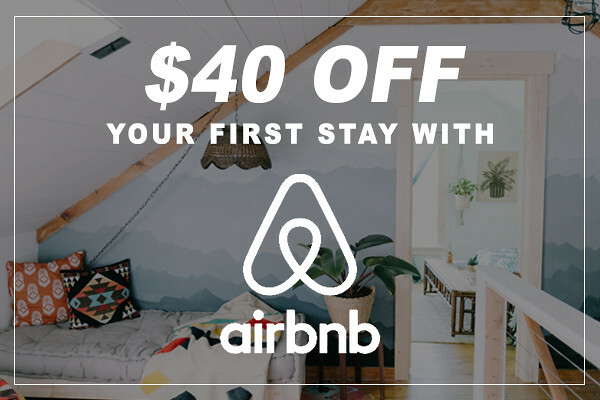 The strings are more of a guideline to get you started. 8. Next I made another bench section that was two sections away from the one I just put in place. I lined it up with the strings in it's section. I made sure my bench seat/top pieces that belong in the section between these two sections would fit into the space between and it turned out they were a little too big. I placed them on top of the other sections and traced the right angle from underneath, and then cut the wood. 9. Next I proceeded to add the brace pieces before screwing on the tops. I measured as needed, cut the wood and then screwed in the braces. Then I put the top pieces in place and screwed them in. 10. Repeat these steps in whatever order you prefer until you've completed all sections. When I got to my last two sections, I realized that they were a lot bigger than I wanted them to be, so I ended up adding a 9th section so there wasn't so much spaced between the stands. This is definitely a project that you need to tailor for yourself and your pool. Once it's all done, you should have a sturdy (and pretty heavy) bench on your hands. We actually plan to paint our bench so it will keep longer- I definitely don't want to be making one of these every other year. This bench easily sits 8 people, and techincally you could have 8 people sitting in the pool at the same time. Not saying we've done it, but it could definitely be done. This may have been the best thing I've built in a while, it has literally changed our stock tank pool game. Anyway, I've tried my best to explain this madness. I'll do my best to answer any questions you may have! If you liked this post and would like to see more like it, please pin the image below. P.S. 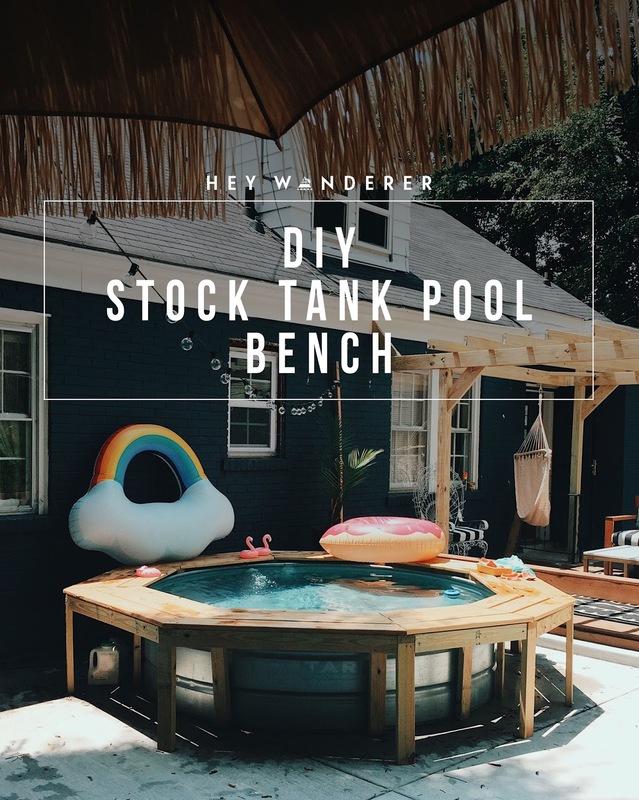 If you haven't built your stock tank pool and need help, we have a whole tutorial RIGHT HERE!